Marvin has been feeling a bit cold lately so he began to think about what the coldest place on earth would be like. He looked in the library and he found out that the coldest place on earth is Antarctica with the coldest recorded temperature of -89.6 degrees. This is so cold that your teeth can shatter and if you tried to breath the air, your lungs would freeze right inside your body. Antarctica is also the driest place on the earth, yet it holds 70% of the world’s fresh water. All of the water is frozen and if it were to melt, the world sea levels would rise by about 65m. This means that some places that have people living on them would be covered by a lot of water! c/o Chiangmai Mail Publishing Co., Ltd.
1) Owls get the best grades in which kind of math? 2) What is a monster’s favorite bedtime story? 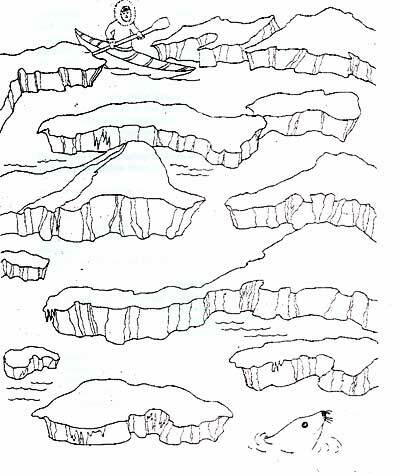 3) What do you get if you cross a canary with a 40 foot snake? 4) What kind of bee doesn’t speak very clearly? During last week’s bi-weekly devotional time, the children from the German Christian School Chiang Mai (CDSC) were treated to a unique performance. They experienced the world of tricks and illusions. Hard to believe, but it looks like it is snowing at CDSC. 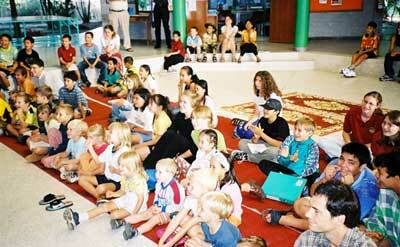 Sparkling eyes, wherever you look, young and old were fascinated and enjoyed the diversity of a normal school day. The performers were Michael and Kimberly Stinton, better known as “Sparky” and “Honeybun”, a couple from the USA invited to North Thailand by the “Pioneers”. During their 6-week tour through the north they performed and taught a variety of tricks at different occasions. 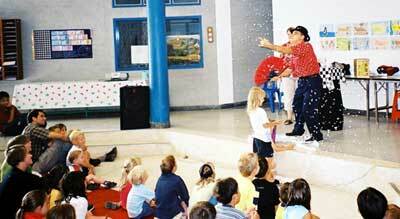 Their one-hour show at CDSC kept the children from Kindergarten through Grade 11 fascinated. One of the messages from “Sparky” and “Honeybun” to the children was that they could show them tricks and illusions, but it was only God who could do the real wonders. “Sparky” worked with ropes, rings, balls and papers, and guided the audience through the magical world of making objects disappear and reappear in different sizes, shapes and numbers. A 17 year-old schoolgirl from Mukda Han Province has discovered fossils dating back 270 million years near a relative’s house in Chaiyaphum Province. Suriwan Nuancharoen, a M5 student at Nong Sung Samakiwhithaya School, whose fossil project is part of a ‘genius development’ project run jointly by the National Science and Technology Development Agency and the Office of the Research Support Fund, said that she discovered the fossils by pure coincidence while visiting relatives in Tuek Laeng village. Suriwan said that she had been given the strange looking stones by the villagers, who believed them to be insect cocoons, and who gave them to visitors believing them to be items imbued with sacred significance. Curious as to what the stones were, she had proposed her project to the NSTDA’s genius development scheme, which selected her as one of 100 recipients of a research award and allowed her to work in conjunction with Dr Somchai Nakhaphadungrat from Chulalongkorn University and Dr Yoshio Chato from Japan. Working together with the scientists, she conducted detailed research on the stones, and found to her immense surprise that they were in fact coprolite, the fossilized feces of ancient reptiles from the Permian era around 270 million years ago, before the age of the dinosaurs. Dr Yoshio said that her discovery marked the first time that coprolite from rare animals had been found in Thailand, as in the past such fossils had only been found in New Mexico. He said that the Thai fossils were particularly impressive as they were almost complete. Describing the fossils, he said that they were black, and that the large specimens were like a long spiral with a diameter of five centimeters at the widest point, 15 centimeters long and five centimeters wide. The skin was smooth, and careful examination showed a series of concentric circles. The fossils also contained phosphate, fish scales and bone matter. The Thai Department and the Thai Parents Association at Chiang Mai International School (CMIS) held a “Thai Day 2003” on March 25 to show the correct traditions of the Songkran water pouring festival. 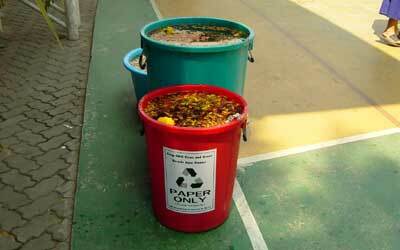 There were also varieties of Thai foods, drinks, desserts and Thai herbal products and enjoyable Thai games during the school Songkran Festival including lucky dips and splashing water over each other. 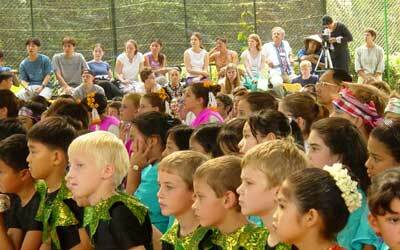 This activity is held every two years, alternating with the International Day. 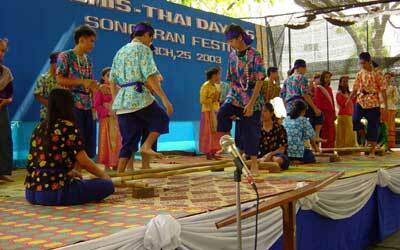 Grade 8 students perform “Lao Krathob Mai”. The best male teacher and student outfits for Thai Day smile happily after getting 5,000 baht prize. Grade 6 and 7 boys performing “Fun Daab Krabi Krabong”, Thai sword fighting. Extra water with Dao Rueng flowers for traditional water pouring. Lovely girls in the procession pay respect to their teachers. Grade 6 and 7 girls performing the “Fingernail Dance”. 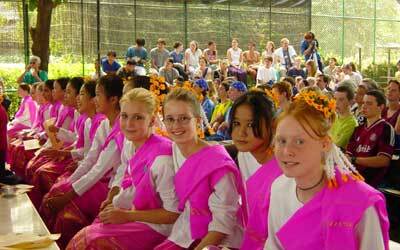 Ajarn Supaporn Yanasarn and all CMIS teachers waiting on stage for the “Paying Respect to the Elders” ceremony. 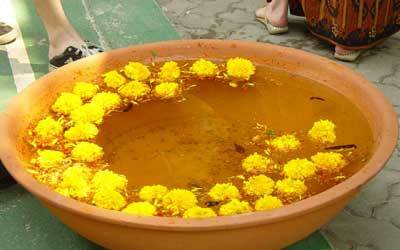 Water bowl with Dao Rueng flowers prepared for traditional water pouring. 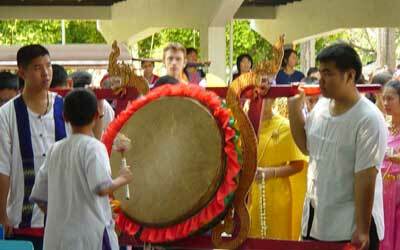 A small boy beats the “Glong Sabat Chai” drum at the front of the procession. CMIS students watch the stage performances. Pretty girls from grade 6 and 7 watch the stage performance. 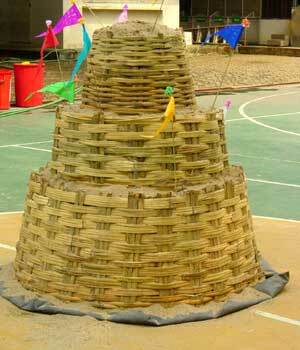 Sand pagoda built by CMIS students to celebrate their Songkran Festival.